This belongs to a small group of very similar bottles all made from the same distinctive material. The unique material and the style of carving employed in this group of bottles suggest carvings from a single workshop, and possibly even a single hand. The anonymous carver was a master of imaginative use of natural markings in stone, and a technically impressive carver. 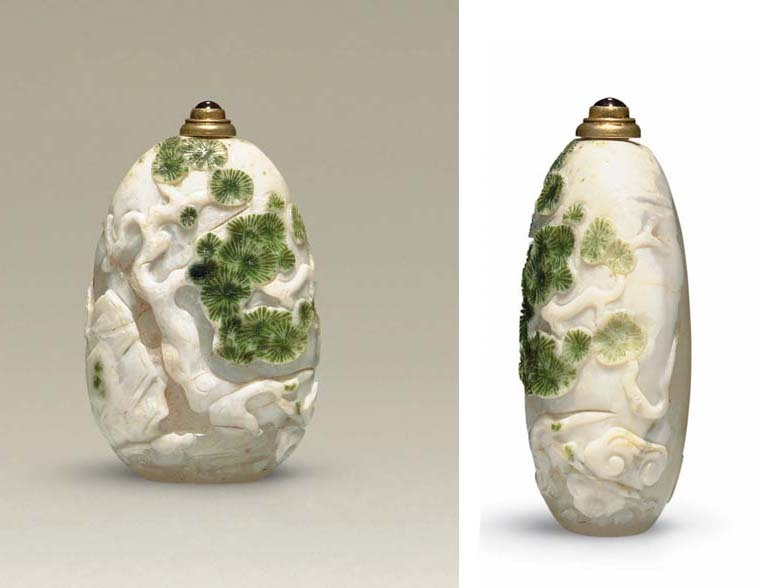 See similar examples including one with red-eyed cranes in the collection of Mary and George Bloch, illustrated by Moss, Graham, Tsang, A Treasury of Chinese Snuff Bottles, Vol. 2, Quartz, no. 332; another illustrated by Moss, Graham, Tsang, The Art of the Chinese Snuff Bottle. The J & J Collection, no. 159; a third in B. Stevens, The Collector's Book of Snuff Bottles, no. 585; one in the collection of the Marquess of Exeter, illustrated by H. Moss, Chinese Snuff Bottles No. 6, Q. 60; another formerly from the Reif Collection and sold in these rooms, 18 October 1993, lot 152; and another sold at Sotheby's Hong Kong, 5 May 1994, lot 1405. The subject of the pine tree is the common thread in the series, with the green "skin" of the material used to form clusters of pine needles, which are carved with radiating incisions dotted with small, randomly placed circular depressions. The rock formations are depicted by simple incised linear frames outlining the overlapping angular, jutting forms.